You are a walking, living, breathing story. There’s no question about it, you’re going to leave a legacy, a mark, an after-thought. The question, then, is what kind of legacy you’ll leave. When it’s all said and done, my hope is that people will remember me for loving much and loving well. That’s the story I want to tell. No piece of paper, degree hanging on the wall, or promotion will amount to anything in my world if I haven’t loved from the depth of my being. Sometimes I remember that truth and sometimes I forget. On the days when I feel insignificant and believe that I’m unknown and unseen, it helps to remember that He is the One authoring my days. If I trust Him with the pen, then I must in turn trust Him with the story. The story of your life is yours alone and if you don’t live it, no one else will. But it’s really not about us. It isn’t about me, it isn’t about you, it isn’t about what chapter we’re in or how “big” our stories are. When we lay hold of the truth that every story matters, we’ll begin to see and believe that our story is included in the “every” story. And then we’ll have to realize that we haven’t done the writing, but it is our job to do the story-telling. We don’t need to go chasing after other scenarios or opportunities. We don’t need to look at her sentence and get jealous over her paragraph. No, that is her story. I’ve got mine; you’ve got yours. And every story matters. Last year I wrote for 31 days on why every story matters. As the month came to a close, I wrote a prayer for the story-tellers. (That’s you, friend.) You can read the full prayer here, but I’d love to include a little bit of it below. 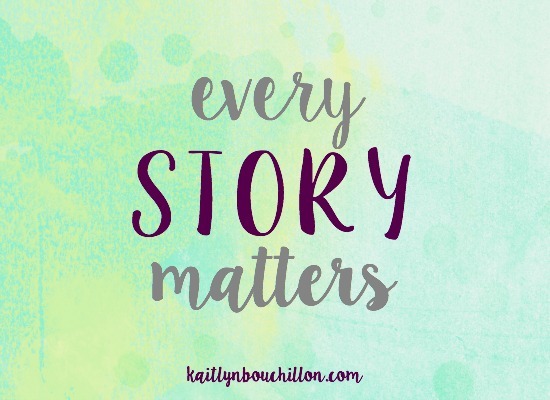 Every story matters, but sometimes we just need to remember that ‘every’ includes mine. It includes yours. You are a walking, living, breathing story and you matter. Lord, may we speak only your words, opening our mouths only when you tell us to. And when you tell us, may we not lock our jaws or hesitate for any reason, but instead follow your leading and begin the story again. Help us to recognize that our story finds its meaning in You. Show us that the ending isn’t necessary for the here-and-now to be beautiful. Remind us that you turn messes into messages and tests into testimonies. We choose today to trust that our voice has a purpose – even if we only know how to whisper. We choose to believe there is power in our stories because You are the one holding the pen. Remind us we are yours and may we live today in grateful praise, ecstatic with the sheer thought of being a child of the King. We love you and thank you for writing the pages and authoring the story of our lives.